"These are a spicy twist on traditional taquitos. The slow cooker gives this recipe ease, while the flavors keep things exciting! Serve with sour cream, guacamole, or avocado ranch salad dressing." Combine chicken thighs, cream cheese, jalapeno peppers with juice, green enchilada sauce, salt, and black pepper together in a slow cooker. Cook on High for 3 to 4 hours. Shred chicken with 2 forks and stir with sauce in the slow cooker to combine. Spread tortillas out on a flat work surface and sprinkle pepperjack cheese evenly in the center of each tortilla. Spread about 2 tablespoons of chicken mixture over cheese on each tortilla. Tightly roll each tortilla and place, seam-side down, on the prepared baking sheet. Brush top and sides of each rolled tortilla with vegetable oil. Bake in the preheated oven until cheese melts, and tortillas start to brown, 10 to 15 minutes. Set oven rack about 6 inches from the heat source and preheat the oven's broiler. Cook taquitos under the broiler until crisped, 2 to 3 minutes more. 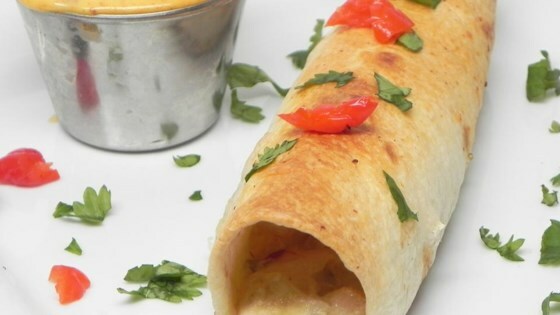 Check out these creamy and spicy taquitos! Just tried this recipe and took it to a social gathering. It was a big hit and disappeared very quickly. Also gave out the recipe to others. I didn't change a thing. Very yummy. I added more cream cheese and more green sauce they were amazing!